Norwegian State Secretary (State Minister) Ms. Marianne Hagen concluded a successful visit to Sri Lanka. During her official visit, she announced that Norway will assist Sri Lanka with NOK 60 million (approx. USD 7 million) over the next three years to achieve the important goal of becoming mine-free by 2020. The contribution to mine action was launched at a meeting between Hon. Prime Minister Ranil Wickremesinghe and Ms. Marianne Hagen in Colombo on 5 March. Thereafter, Ms. Hagen visited Muhamalai minefield in the North where Norwegian funds will be utilized. 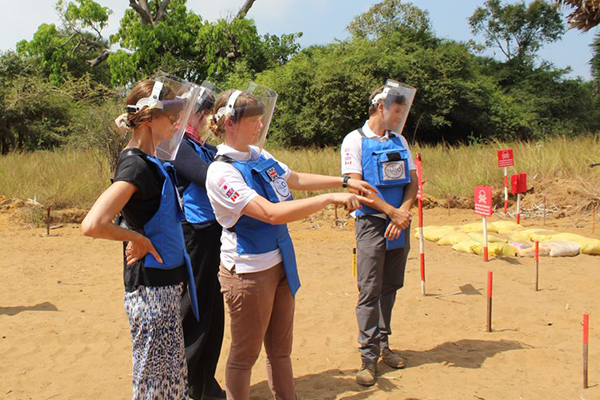 The funding provided by Norway will be channeled through two mine clearance organizations, Halo Trust and Mine Advisory Group (MAG). During the visit, Ms. Hagen also called on Foreign Minister Tilak Marapana, Finance Minister Mangala Samaraweera and the Governor of the North Dr. Suren Raghavan and discussed ways to build partnership in areas of common interest. The State Secretary acknowledged the achievements towards implementing the recommendations in UN Human Rights Council Resolution 30/1, and underlined the importance of continuing the process of democracy and reconciliation. Ms. Hagen also met with representatives of several civil society organizations in Colombo and Jaffna, the Sri Lanka Human Rights Commission and the Office of Missing Persons. Ms. Hagen visited SLASSCOM in Colombo and expressed Norway’s intention to continue support for its initiatives like “Kids Can Code”. Norway will also encourage further fruitful cooperation between the Sri Lankan and Norwegian ICT sectors and other key sectors for sustainable growth and jobs.